Anti urban segregation through zoning. Anti fossil-fuel-based urbanism. Anti urban megastructures. Anti suburban labyrinths. Pro new localities, walking, and slow architectures. These formulas have become standard-issue in the discourse on architecture and urbanism today, and all of these themes relate to drawings by Léon Krier, the Luxembourg-born architect and planner who is more typically associated with the much-debated architectural preferences of Prince Charles (to whom he has been a long-time adviser) than with progressive architectural thinking. As part of the Cynthia Davidson-edited Writing Architecture series, MIT Press has published Drawing for Architecture , featuring a selection of Krier’s drawings from the past 35 years. This series of books—by Paul Virillio, John Hedjuk, and Anthony Vilder, among others—offers thinking that is by turns polemical and speculative. The premise behind the series is that the authors rewrite architecture as much as they write it, and rewriting—or redrawing—is exactly what Krier does. The handsomely petite book showcases Krier’s cartoons, which at first sight, in their clear and often witty style, might not appear that different from, for instance, Le Corbusier’s sketches. However, a second glance reveals that Krier’s doodles overtly ridicule modernist thinking, and relate much more to late-19th century drawings of urban situations, such as those by Camillo Sitte. it is a reference that does not surprise, as Krier has been fighting a long—at times lonely—battle to reinstall traditional values in architecture and urbanism. In sharp contrast to many 20th-century modernists, Krier believes in the production of spatial experiences that stay closer to the body, and thus to nature. Going through his drawings, which often juxtapose what Krier considers to be “good” and “bad,” one encounters a spatial thinker’s “angry bursts,” as Krier writes in his brief introduction. When he stays away from the promotion of traditional styles, Krier’s contribution to the discourse on architecture and urbanism casts him as a smart cultural observer who, through his explorations, may inspire a younger, more supple-thinking generation of designers to develop new spatial languages that do not have to be traditionalist or modernist, but are perfectly in line with the potential of a new decade. David van der Leer is Assistant Curator of Architecture and Design at the Solomon R. Guggenheim Museum in New York. The writers on their latest collaboration, Brothers of the Gun: A Memoir of the Syrian War. 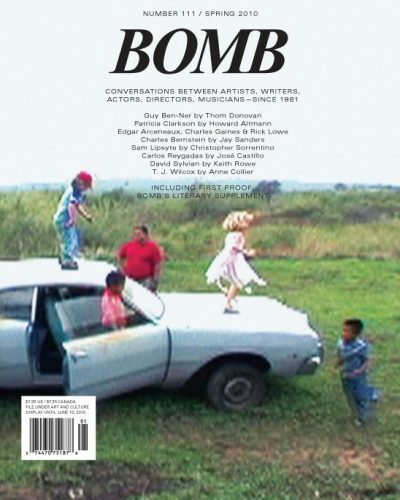 Featuring interviews with Guy Ben-Ner, T.J Wilcox and Anne Collier, Sam Lipsyte and Christopher Sorrentino, Carlos Reygadas, Patricia Clarkson and Howard Altmann, David Sylvian and Keith Rowe, Edgar Arceneaux and Charles Gaines and Rick Lowe, Charles Bernstein.